The earliest known image of the Virgin Mary dates back to the 2nd century. 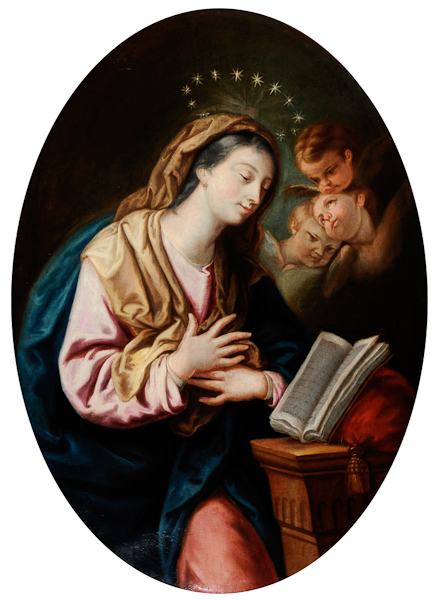 It was another 300 years before Mary's enduring presence in Christian iconography was secured, when the Council of Ephesus gave her the title 'Mother of God'. Images of the Virgin Mary were then regularly seen in Byzantine and medieval art. Later during the Renaissance her image continued to be represented, particularly as most art was commissioned by the Church. Around Christmas we naturally think of images of Mary holding the newly born Jesus, along with depictions of the Nativity. However, this painting of Mary illustrates one of the most significant events leading up to Christmas. The Annunciation is the moment in the Bible when the Angel Gabriel tells Mary that she will bear God's son. And the Lord himself shall give you a sign. Behold, a virgin shall conceive, and bear a son . . .